The heroes of all time have gone before us. We have only to follow the thread of the hero path. we will come to the center of our own existence. we will be with all the world. 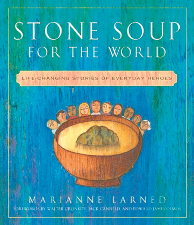 Stone Soup for the World: Life-Changing Stories of Everyday Heroes is a book with a mission and vision. Called a “handbook for humanitarians,” it shows us what’s working in the world and what it takes to build a healthier tomorrow. It is a call to action, challenging people to think about how we want the world to be and what each one of us can do to make it a better place for us all. The Institute’s Educational Curriculum is based on Stone Soup for the World: Life-Changing Stories of Everyday Heroes. It has been used in 120 communities in a wide variety of ages and settings.